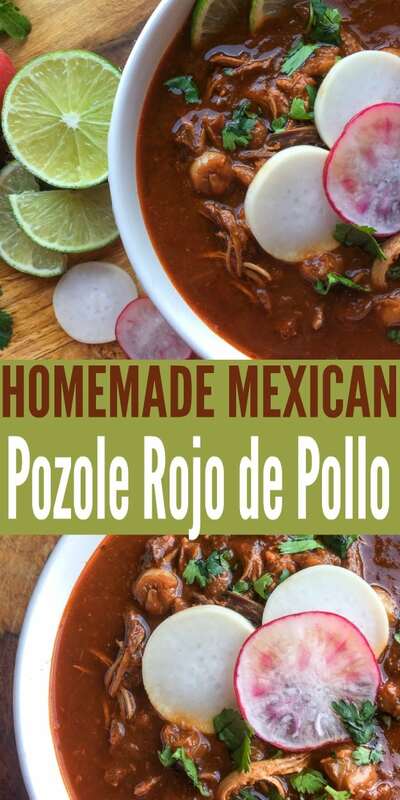 If you’ve never heard of pozole rojo de pollo, keep reading because this is a must try recipe! This authentic and hearty traditional Mexican soup has a great boost of flavor from dried chili varieties. Ancho chilies are more readily available in most grocery stores, but guajillo chilies can be much harder to find in many areas. However, you can usually find both in Mexican speciality markets and ordered online. 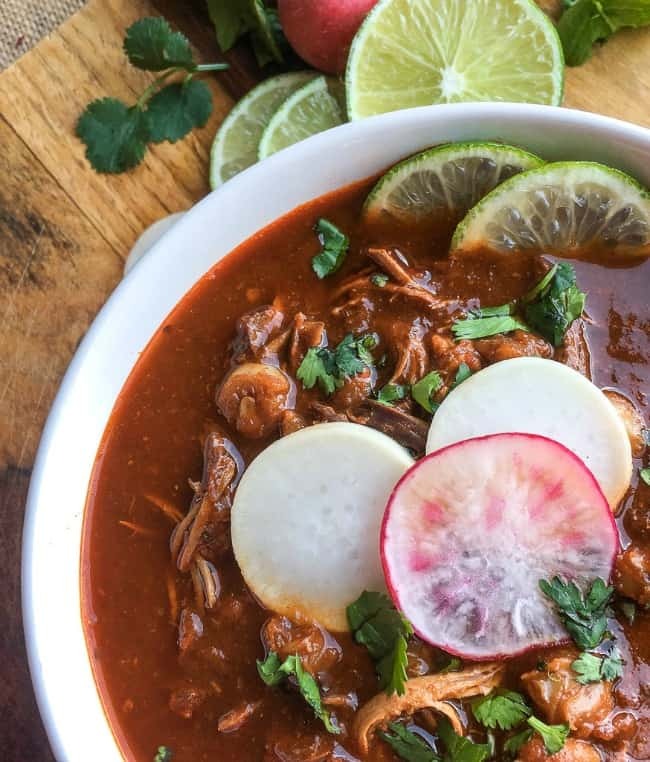 Pozole is traditionally made with pork, this flavorful version features boneless, skinless chicken breasts instead. 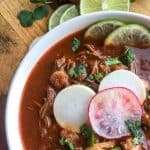 This brothy, flavorful soup is perfect served with classic pozole toppings, including sliced radishes, shredded cabbage or lettuce, diced avocado, red onions, and/or fresh chopped cilantro. 1. Place dried chilies and smashed garlic in a small saucepan and add enough water to cover. Bring to a simmer over medium heat and cook until the chilies soften, around 5-6 minutes. Remove from heat and set aside to cool. 2. While the chilies are simmering, heat olive oil in a large soup pot or Dutch oven over medium-high heat. Add onion and garlic and cook, stirring occasionally, until the onion is soft and translucent, around 4-5 minutes. Season with salt and black pepper, to taste. 3. Add ground cumin, Mexican oregano, smoked paprika, and cinnamon. Stir to combine and cook for 1-2 minutes, or just until the spices become fragrant. 4. Add chicken and reduce heat to medium. Cook until lightly browned on all sides, around 2-3 minutes per side. 5. Add bay leaves, chicken stock, and hominy. Increase heat to medium-high and bring the mixture to a rapid simmer. 6. Once simmering, transfer the ancho and guajillo chilies mixture to a blender or a food processor and blend until smooth. Pour chili mixture into the pot and reduce heat to just below medium. Partially cover with a lid and cook for at least 30 minutes or up to 4 hours to give the flavors more time to develop. 7. After at least 30 minutes, remove from heat and carefully shred the chicken using two forks while still in the pot. Remove bay leaves and discard. 8. Ladle hot soup into individual serving bowls and top with sliced radishes, fresh cilantro, or other desired toppings. 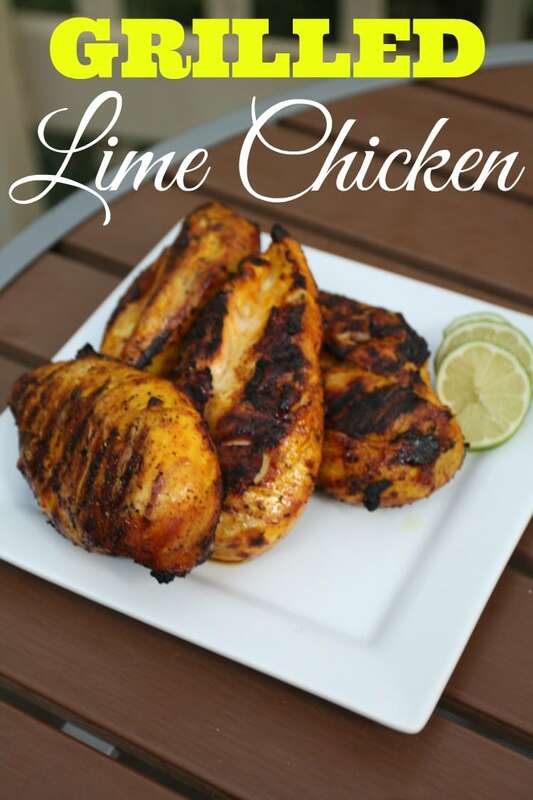 Serve immediately with fresh lime wedges for squeezing. Enjoy! Place dried chilies and smashed garlic in a small saucepan and add enough water to cover. Bring to a simmer over medium heat and cook until the chilies soften, around 5-6 minutes. Remove from heat and set aside to cool. While the chilies are simmering, heat olive oil in a large soup pot or Dutch oven over medium-high heat. Add onion and garlic and cook, stirring occasionally, until the onion is soft and translucent, around 4-5 minutes. Season with salt and black pepper, to taste. Add ground cumin, Mexican oregano, smoked paprika, and cinnamon. Stir to combine and cook for 1-2 minutes, or just until the spices become fragrant. Add chicken and reduce heat to medium. Cook until lightly browned on all sides, around 2-3 minutes per side. Add bay leaves, chicken stock, and hominy. Increase heat to medium-high and bring the mixture to a rapid simmer. Once simmering, transfer the ancho and guajillo chilies mixture to a blender or a food processor and blend until smooth. Pour chili mixture into the pot and reduce heat to just below medium. Partially cover with a lid and cook for at least 30 minutes or up to 4 hours to give the flavors more time to develop. After at least 30 minutes, remove from heat and carefully shred the chicken using two forks while still in the pot. Remove bay leaves and discard. Ladle hot soup into individual serving bowls and top with sliced radishes, fresh cilantro, or other desired toppings. Serve immediately with fresh lime wedges for squeezing. Enjoy! 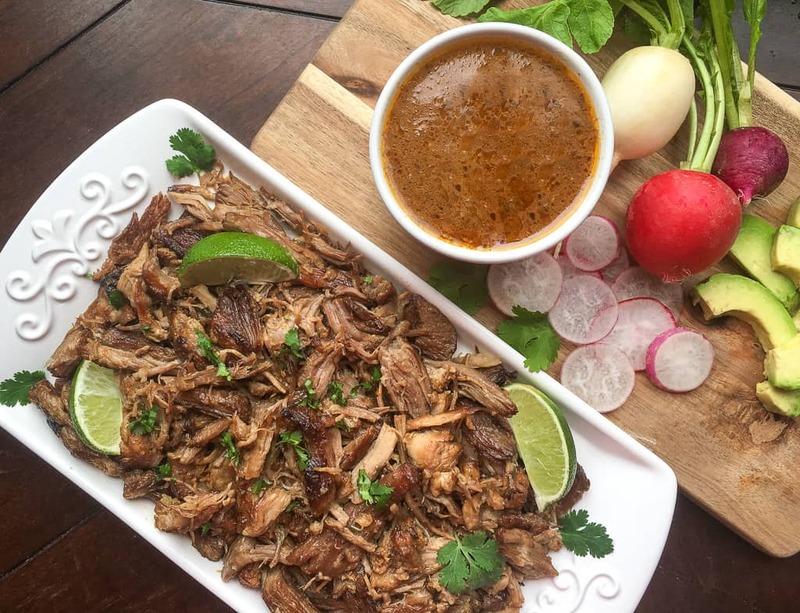 If you enjoyed this Pozole Rojo de Pollo recipe, make sure to check out other popular posts!